Home Entertainment Pulkit Samrat enjoys water sports in Thailand! 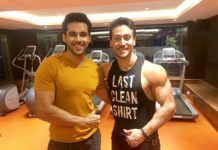 Pulkit Samrat enjoys water sports in Thailand! Pulkit Samrat seems to have made the most of his trip to Thailand recently. The talented actor who was recently in Thailand for a professional commitment, apparently took some time off to explore his newfound passion – water sports.